Train toys are built, produced or manufactured for to sole purpose of educating and to provide fun and joy to kids. It also does provide the same entertainment and satisfaction to some adults. However, adults might prefer to choose over different electric train sets than a simple wooden railway set that lacks some technological features such as motorized engine, remote or transformer control, sound, light and more. All of these features on the other hand might not get appreciated by children with age under 8 years old nor can benefit highly from it. Electric train sets and a wooden train set are both educational toys, but an adult or a teen would who loves train would not want to spend some time playing with a wooden set. In addition, electric train toys are far more expensive. You would not want your 3 year old child play with an expensive set knowing that kids in that line of age tends to play roughly with their toys. They can easily smash, throw, drop or break the metallic/plastic made electric train toy, spilling your money down the drain. Adult train lovers would play with their train set as a means of relaxation, brain stimulation, stress relief or self-satisfaction as they are reminded of how great their childhood was. The benefits of train sets are remarkable. Regardless of the age of the user, may it be an adult or a child, electric trains have a large supply in the market from different brands, well and little known by people. It will lead your search of the best product with a vast options. That is why we decided to give you a long list of the most viable electric train toy products with good ratings, reviews and recommendations from actual customers who have experienced purchasing and owning a toy. This could work out to be a good electric train sets for children as it has an affordable price close within the range of your budget. It is actually one of the best beginner train set. It can be played with by you or your kids the moment you take it out of its box. The set is an HO-scale, locomotive diesel train with a bright and functioning headlight. 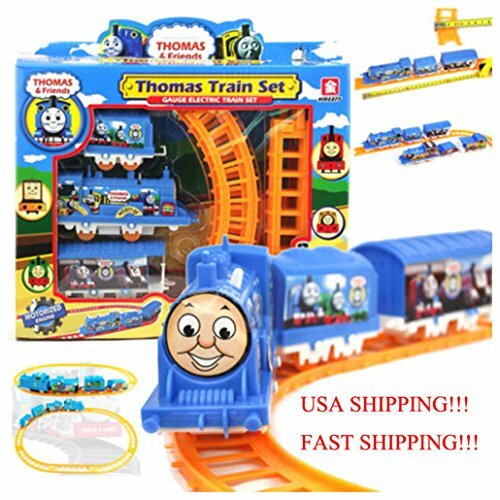 Although this is great for kids, it might not be a good electric train sets for toddlers due to small parts and accessories included in the set. It is recommended for ages 8 years or higher. 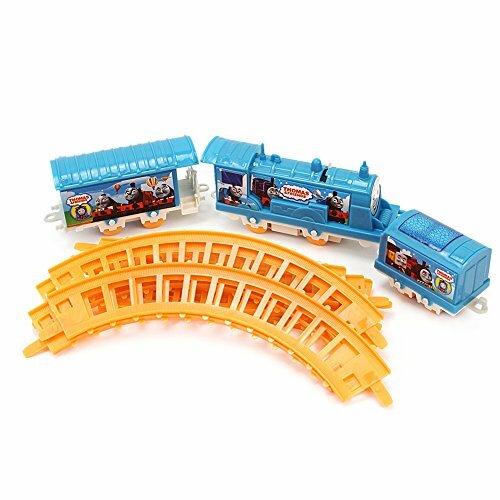 The set includes its own circular train tracks made of durable plastic. The train has sound, movement and smoke puffing control system, all installed in the RC feature. It has high quality and detailed design, all for a cheap and very low price. 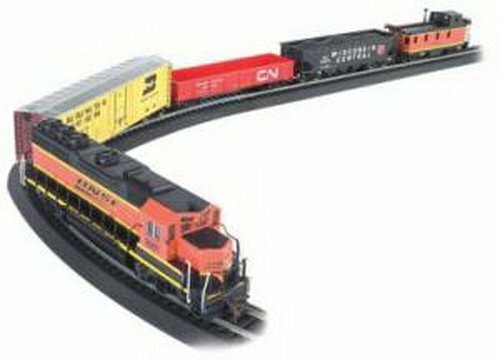 Bachmann Industries are a well-known train toy manufacturer. This one of their affordable and cheap electric train sets that features a Jingle Bell Express train. It has a 0-6-0 electric powered, steam locomotive that runs smoothly on its free 47 inches by 38 inches wide oval train tracks. It is a delightful train for kids and adults. The train is decorated to represent the Christmas holiday. It can work great as a toy and decoration. One of the reasons why model electric train sets are not recommended for children under 8 years old is its complex set up or assembly. This N-scale Super Chief train is a ready to run electric train toy that requires minimal assembly but involves a transformer, wiring and/or electricity. It can work well for them but always ensure that they have adult supervision as they play. The complete train set includes 3 train cars, 1 train engine car, a remote control that turns it on/off and let the train move forward and reverses. 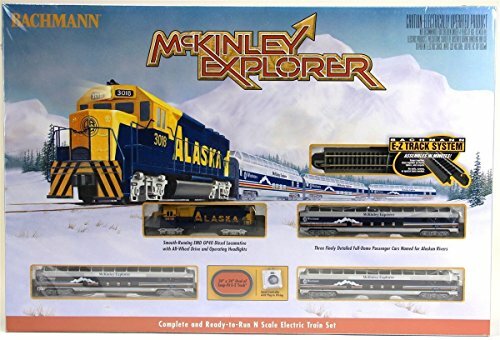 This is the McKinley Explorer electric model train sets for adults from Bachmann Industries. It features a train going on a trip to Alaska. The set is powered by a GP40 – EMD locomotive with a fully functioning headlight installed in the front. 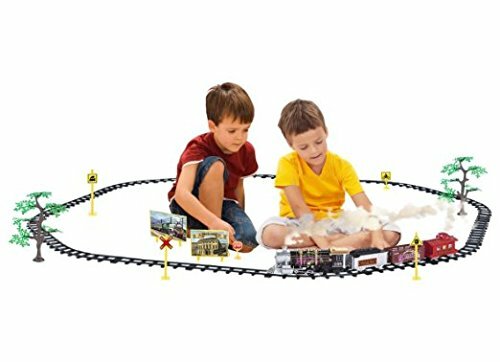 It includes a speed controller, an oval train track with dimensions of 34 inches by 24 inches, 1 train engine car and 3 passenger cars. There is a highly illustrated and detailed manual included that will provide you with a fast and efficient assembling. Another classic steam train from Bachmann Industries, this is one of the best electric train set you can have. The set includes 6 pieces of train parts and accessories. This is an N-scale train set that has everything you need to set up and start your own railroad experience. It requires only a few amount of effort in assembling. You can practically play with it instantly right out of the box. This is a slightly expensive electric train sets for adults and that there are only a few of this left roaming around the market. It features a ready to run, 4-6-0 electric powered steam locomotive. It is a G-scale train set. The tracks included are made of steel and highly strong, stable, durable and sturdy. This can work as an electric train toy or a decorative train under a Christmas tree during the holidays. 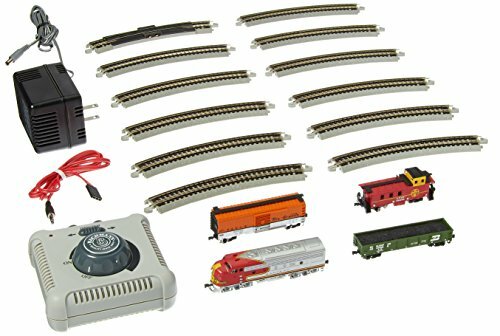 It is a complete set filled with all the necessary pieces you need to set up your own electric toy train sets. It features a Bachmann HO scale train transporting the Liberty bell at the back of the flatcar. 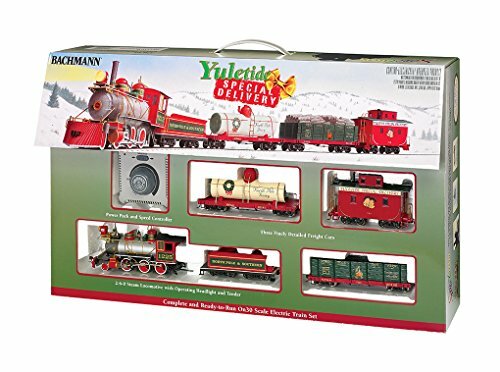 The set includes a steam locomotive train engine car, a coal tender, 2 long passenger cars and a flat car. There is also a free sturdy train E-Z tracks that forms an oval shape having a dimension of 47 by 38 inches. This Bachmann toy electric train sets features Durango and Silverton. It is an HO scale train set built with sturdy construction. This set passed different safety and standard test of National Model Railroad Association or NMRA. It has a free, average sized, durable train tracks included. It is great for beginners or starters who wants to try out a wonderful train journey. This might be the best electric train sets for kids you are looking for. It has the features of an expensive train set but remains easy on the pocket. It features an F7-A Diesel train locomotive. The electric train runs stably on the tracks, does not derail or stop at turns. There is a bright and powerful headlight installed at the head of the engine car. It is a ready to run, N-scale electric train set for you and your kids. 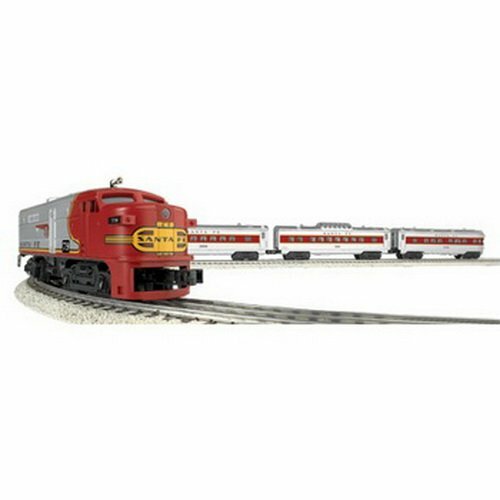 Bachmann Industries present to you the Thunder Chief electric toy train sets for young and adult train lovers. 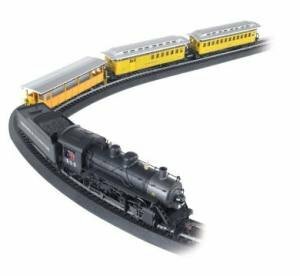 This train set has great power, a fully functioning command control features, E-Z durable train tracks that is easy to set and more. The train uses an E-Z Mate coupling system for a stable attachment. The durability of this train set is very reliable. It can last longer than most electric toy trains. As you noticed, Bachmann Industries are well-known to manufacture so many electric train sets for kids. That is why the majority of the trains in most list you’d see are from Bachmann Industries. This next item is an amazing Echo Valley Express train. It is an HO scale train that uses an E-Z Mate couplings. 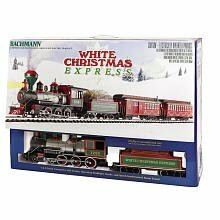 This is a great Christmas toy electric train sets brought to you by Bachmann. It will work great to be laid out on your living room tree on the holiday of giving. It has an average size train tracks with dimensions of about 47 inches by 38 inches. The E-Z oval train track comes with an easy snap-fit. The set is packed with a strong and powerful motor and a speed controller. Some electric trains intend to bring out the Christmas spirit within the house. 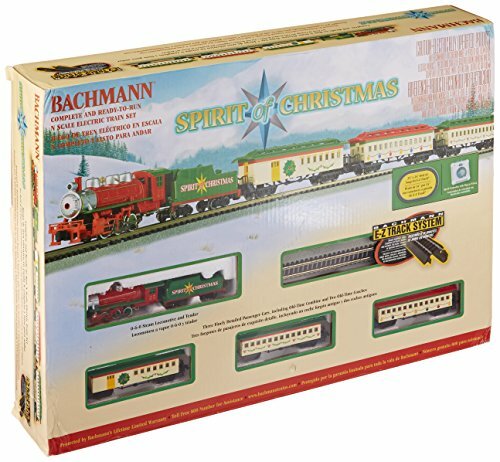 This is a lovely Spirit of Christmas electric N-scale train set of Bachmann. This will assure you and your kids a long time of fun and bonding during the holiday. It is a 0-6-0 powered steam train locomotive with a tender. It is a complete set, Christmas train set for all levels of train experience. It saves you the trouble of buying parts to parts. As most of our Electric Train Set is from Bachmann, here is a video that shows an actual HO train scale from unboxing, installation/assembly and up to making the train run. Hope this video serves as a great reference other than the instruction guide included in your set. This is inspired from the famous cartoon train series, Thomas and Friends. 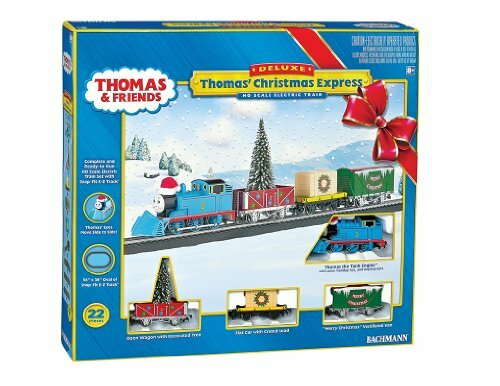 It features a holiday themed Thomas the train transporting a large Christmas tree. The face of Thomas has moving eyes that adds more fun. It uses a hook and loop coupling system with international standards. The set is an HO scale electric train, complete with tracks, powerful motors, train cars and control. Sadly, this reasonably priced train set has only a few stocks left. The details f this train is remarkable. It is a sharp and elegant looking, classic steam train from Bachmann. This is the Greyhound electric O scale train. It features a large oval track of 60 inches by 40 inches dimension. It has a 3 rail design and includes all the necessary things you need to get a train set running. At an expense, this train is actually built to last for a long time. 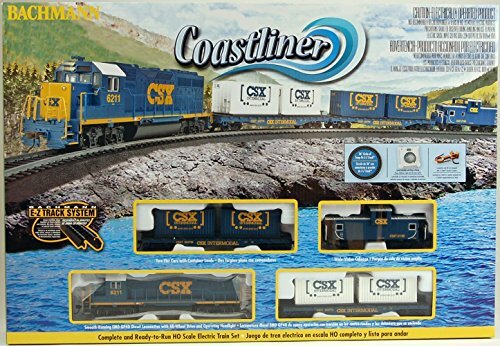 Another Classic electric model train set from Bachmann, this is the Coast liner train set. It uses a strong and powerful GP40 Diesel train locomotive with an all-drive wheel and a bright working headlight. It includes a bright yellow boxcar, a large caboose and a coal car. It is very comprehensive with its details. Handle-bar, ladders, paintings, design are relatively close to being realistic. 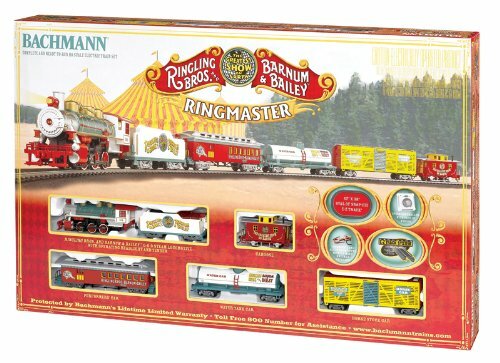 This is the Barnum and Bailey Bachmann Industries, electric model train set. The set includes a strong 0-6-0 locomotive with a coal tender. As most electric trains have, it has a durable bright headlight, a water tank car, performer’s car, caboose and more. The length of this electric train is fairly long compared to most Bachmann’s train collection. The set is an HO scale train that conforms to the requirements and standards of the NMRA. This is the Santa Fe Bachmann electric toy train sets. 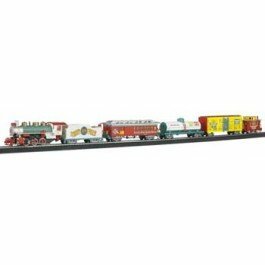 It is a long train set consists of train locomotive and 3 pieces of freight cars. It includes its own tracks and a power pack. The train engine locomotive has dual motors for more power and consistency. It has sound feature that blasts whistle, bell and horn sound. The freight cars have illuminated interiors which make it bright and relaxing to look at on a dim environment. Santa fe train sets continue to be a favorite among train enthusiasts everywhere! One of the few G scales, best electric train set of Bachmann Industries is the North Woods Logger train. It is designed and conceptualized from a classic log train that transports large tree logs from point to point. It has an awesome, realistic detail and aesthetics. The length and size of the train is average. It includes a train engine car, tender, a flatcar that carries the logs and a small caboose. The set includes and uses hard and durable alloy train tracks. Watch and experience a fast miniature electric train set that delivers things from the north pol on the Yuletide Holiday. The set is good for beginners or starters. It is complete, ready to run, easy to set up train set. The pack includes its own 56 inches by 36 inches oval E-Z train tracks. It is an O-scale train, packed with great stability, sturdiness, power and includes remote features. This train can also work as a Christmas train due to its design and details. In here we bring you the classic train, The Plainsman, from Bachmann Industries. It is G-scale, fairly large, read-to-run train set. The electric train features a 4-6-0 steam train locomotive and a tender with a powerful and long lasting headlight at the front. The set includes an oval train tracks made from durable plastic, a stock car and a caboose. It is complete with sound, remote control and smoke features, all for a reasonable and affordable price. You would want a list only filled with an expensive, adult catching train set wouldn’t you? The next one is an amazing electric train sets for kids. It is the Pacific Flyer, HO-scale electric train set. It is easily attainable and very affordable. It is good for both boys and girls with age 14 and up. There is some complex assembly required but none that your kids can’t handle. It includes sturdy constructed tracks that do not keep your train from derailing or stopping from point to point. This might work as a good electric train sets for toddlers, given that you provide them with some adult supervision as they play with the set. It features a plastic Thomas the train, electric train set. As the price, materials and design would dictate, it is far more likely to be a good choice for adult train lovers. It is a perfect gift for your young friends or families that are enthusiastic about trains. It only requires 1 double-A battery which is not included in the set. The next product would still be considered and more likely to be categorized as an electric train sets for kids. The design and aesthetics is more pleasing to a child. If you are about to purchase one for a young kid, always be reminded to provide supervision as they play. This set is expected to be in its top performance running on an 18 inches radius curves. It is recommended for children with age 8 years old or higher. This train dates back to the age of Civil War. It is confederate HO-scale Bachmann model electric train sets. This includes all the things you need to lay out your classic Civil war train layout. The set includes 6 pieces of connectable train car pieces, all of which are with exceptional details and comprehensive designs. It has been tested by the NMRA and have passed all standards and requirements, making it safe and credible. The details on this set are on a higher level. 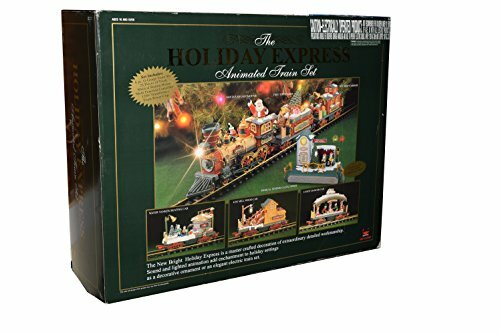 It is an animated, holiday express electric train sets for adults. The set includes 6 pieces of G-gauge or scale train set. It features Santa riding on the train engine. The remote control settings are also on a different degree. You can completely control the movement on all directions, sound and volume control. The train tracks included in the set are versatile. You can change the shape between a circle or an oval, depending on your preference. Of course, the train set’s price is no joke. It is one of the most expensive train set collectors need to spend a lot of amount. Giving you an actual view of the explicit details and design of this electric train sets for adults – Here is a short video that features how it runs through tracks and how user-friendly the remote is. You can definitely say that with its sturdy construction, the design of a great train craftsmanship and the details of the train toy, that the quality is beyond what you have paid for. This is a great Thomas the train, Christmas themed train set. 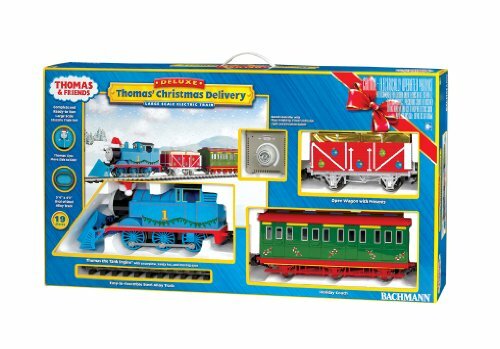 It is the Christmas Delivery electric toy train sets from Bachmann Industries. It has a unique snow plow installed the front end of Thomas. Thomas wears a nice Christmas hat and eyes that moves. The set includes a wagon car filled with children’s presents and a coach car. This train set is ready to deliver all the gifts and presents during the holiday. 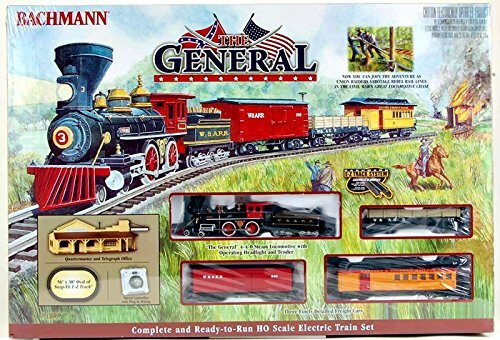 This is The General, toy electric train sets for adults of Bachmann Industries. It has a fair and moderate price. It features a 4-4-0 American steam train locomotive with a powerful engine motor. It includes a classic, old time train cars and accessories. It has the structures and the train track you need to create a possible train layout. The set uses an E-Z mate coupling system for a more stable and smooth ride. The train is reliable, strong and sturdy. It does not derail nor stop at narrow parts of the train tracks, especially during turns. It has a strong metal wheels that fits perfectly on the tracks. The set also has remote control features that allow the user to maneuver the train’s movement, forward, neutral or reverse. The last on the list would be an electric train sets for toddlers. This is to keep your children educated while being entertained by a fancy train. The train is made of durable and non-toxic plastic in most parts. The set includes 3 pieces of train cars that feature Thomas the Train. Thomas is actually a good choice as most kids are familiar with the cartoon train series. It includes free plastic pieces of train tracks that form a small circular shape. This is suitable for children with ages 3 years and above. This Bachman Train set is a ready-to-run set that includes an F7 Norfolk Southern diesel locomotive number 4270 with an operating headlight, am open quad hopper, a Norfolk and Western number 12988 Gondola, a Southern Railway number 1246 wide-vision caboose, Norfolk Southern Body-mounted E-Z Mate couplers, a 47” x 38” oval of snap-fit E-Z Track including 12 pieces of curved track, one piece of straight track, one plug-in terminal rerailer, a power pack, and a speed controller, and an illustrated instruction manual. This train set is designed to ensure that it does not derail easily given the power of the train has. The speed with which it moves with around the track while carrying its load is remarkable. The Bachmann Trains’ Thoroughbred Ready-to-Run HO Scale Train Set is available at Amazon.com for about $80.00 with free shipping. 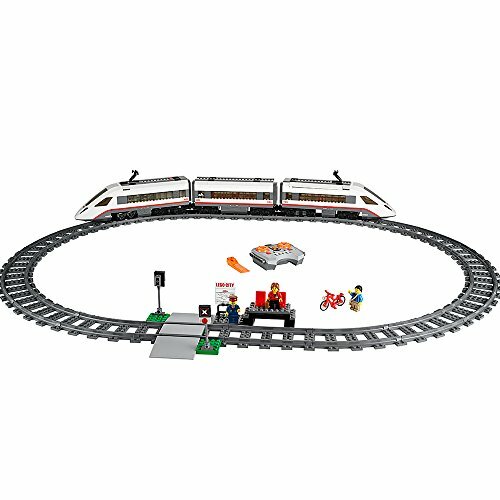 The Lego City Trains High-Speed Passenger Train Building Toy is an electric train set designed to allow your kids to travel around the city. They can circle it in no time with the motorized train. The train runs along an eight-channel track. It is operated with a seven-speed infrared remote control to power around the curved tracks at top speed. The train set also has a high-speed front profile with an electrical contact point on the top. This train set also comes with three mini-figures: train driver, a traveler, and a cyclist. The front car has a removable roof with an electrical contact point and a driver’s cabin with a dashboard. The rear passenger car has a removable roof with electrical contact points, seats, and tables, and the middle passenger car has a removable roof, seats, and tables. The High-Speed Passenger Train Building Toy is available at Amazon.com for about $120.00 with free shipping. The Lionel Pennsylvania Flyer Freight Set is an O-gauge model train. The O-gauge models are among the largest scale model trains, second only to the G-gauge models. The train set comes with the locomotive, tender, boxcar, tanker, and caboose. Each of the cars in this set car is die-cast, and the tank car also features metal handrails and ladders. The set includes a transformer and huge oval FasTrack track. It also has an industrial diorama, telephone poles, and a special billboard. This set has transformer-controlled forward, neutral and reverse operation with a realistic air whistle, a puffing smoke unit, and an operating headlight. The Pennsylvania Flyer Freight Set is priced at about $290.00 plus shipping on Amazon.com.